If you’re planning on using a WordPress page builder theme you can’t go past X. Themeco’s X Theme and Pro are quickly becoming the most advanced and user friendly page builders WordPress has to offer. Packed with features and constantly evolving in both community and support X is becoming a standard for building powerful WordPress sites without heavy coding. 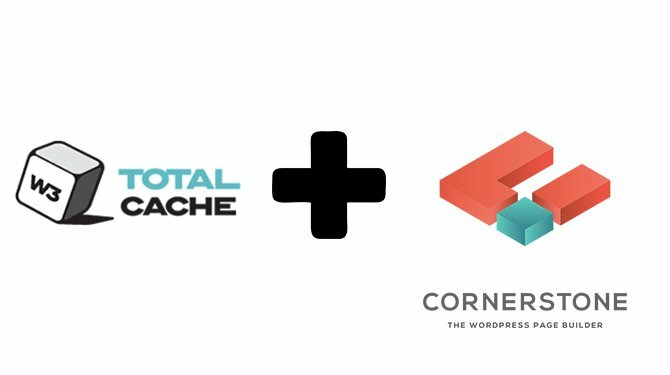 In this tutorial we will look at how to make X theme and Cornerstone compatible with W3 Total Cache and other speed optimization plugins you need so you can speed up your site without affecting the page builder. X theme has some highly advanced built-in software as standard including automatic .css and .js minification and ready to use child themes for making custom edits. Themeco’s dedicated production team works tirelessly to update and improve their software and make Cornerstone one of the best page builders available. However with all of that accessibility and .js power comes some drawbacks. Cornerstone is notoriously not very compatible with some more advanced speed optimization plugins. This means after you’ve done all that hard work speeding up your site chances are you’re going to run into some compatibility issues later on. Luckily we found a simple fix using the Plugin Organizer. When utilized this nifty little plugin will allow you full access to all of the speed optimization plugins you like. And make sure everything is compatible with X theme’s Cornerstone and Pro Theme’s Header, Footer, Content Builder arsenal. Maybe plugin conflict isn’t actually the right word to use here. Technically X theme works well with w3 Total Cache plugins. Things just get rocky when you’re trying to load the page builder when cache plugins are enabled. It’s the cache, especially, which causes problems here making it very difficult to isolate the issue for a direct fix. Those who have been using X theme for some time would not be a stranger to the message “The preview was unresponsive after loading. This is most often related to a plugin conflict or aggressive page cacheing” and often the only solution is to disable and/or delete the speed plugins entirely. The the page builder and the speed plugins are like two of your friends who really don’t like each other. So we need to find a solution to separate them. Disable all speed optimisation plugins while logged into admin! By disabling the plugins for the Cornerstone page builder while logged into administrator we can get the best of both worlds – access to Themeco’s page builder and all the speed plugins working nicely in the background. Thankfully Plugin Organizer will do just that, and it’s not going to add any loading time to your site either. You will be able to work plugin conflict free with the page builder and still have access to all the speed plugins your heart desires. Plugin Organizer by Jeff Sterup is an advanced plugin organization tool that allows you to disable plugins for selected pages (and URL’s!) for your site. This is an advanced user plugin so take care if you’re trying to use its extra features. If you have a website with a lot of plugins you may benefit from its more advanced functionality. However for today we’re going to take advantage of the plugin filter which is very useful for us. Firstly upload and activate the Plugin Organizer plugin. Plugin Organizer is available from the official WordPress.org plugins page. You can download it from https://wordpress.org/plugins, or you can add it directly from the plugins page inside the WordPress dashboard. Simply search “plugin organizer” and it should be the first to show up. Click Install and Activate. Next you need to enable a few basic settings. In the Admin Side Menu scroll down to Plugin Organizer > Settings to open up the main settings page. For our use we need to ensure the Fuzzy URL Matching, Selective Plugin Loading and Selective Admin Plugin Loading options are On. You can use the following settings as recommendations for the remaining options. Leave all other settings as default. Navigate to Plugin Organizer > Plugin Filter in the Admin Side Menu and click on Add Plugin Filter. Once the Plugin Filter loads scroll down to the Plugin Organizer and enter in the details below. NAME – Create a name (we used Cornerstone Plugin Filter, but you can make it anything you want). PERMALINKS – Next we will add your domain which will trigger the filter – https://example.com/ (take note if your website is http or https here). SETTINGS – tick the “Also Affect Children” box. Scroll down to the bottom half of the plugin filter to select which plugins to move across. Here you will have the choice to disable just one, some, or all of the plugins. Select the plugins you would like to move from the Available Items and drag them across to the Disabled Standard – Administrator. In our case we’re only going to move across the plugins which we know are causing conflicts for the page builder. Now the filter is finished and you can publish! You will know if it’s worked when the W3 Total Cache menu has disappeared from the admin bars on the left and top of the WordPress administrator screen. You will now be able to work on Cornerstone without it being affected by the speed optimization plugins. W3 Total Cache is still running in the background, so any visitors using your site will still receive the speed benefits here. If you need to switch the plugin filter off navigate back to the filter and uncheck the “also affects children” check box. This acts as an on/off switch whenever you need to work on the speed plugins instead. Now just to be sure it’s all done, clear any cache attached to plugins and completely clear your browser cache. Then navigate to the X Theme content builder and you should be good to go! Plugin Organizer is open source and free to use, however you can donate to Jeff here. Why can’t I disable the speed plugins on the page builder URL’s? We tested extensively to see if the plugins could be disabled for specific URL strings, but at every corner we ran into problems. So as a consolation we decided to disable the speed plugins when admin is active. This way the page builder is accessible and on the front end your visitors will always be delivered speedy content because the cache and speed plugins will always be active. There are additional plugins affecting the page builder. You can test by adding more plugins to the plugin filter here and checking the page builder again. The browser is being tempramental. You can try returning to the content screen to try another page. If you try and load another page and you’re still having problems then it could also be an issue with your host. Hosting issues with X theme. If you think this is the case read more below for advice and recommendations. X theme is a powerful theme and to get the most out of it you also need a powerful hosting solution. With the plugin setup above you can disable all plugins for the page builder URL’s, however you might still have this message pop up from time to time. This can also be due to your web hosting not having enough power to handle the theme. If you have other questions about X theme and Pro compatibility let us know in the comments below. We would love to hear from you. Should my website be mobile responsive?